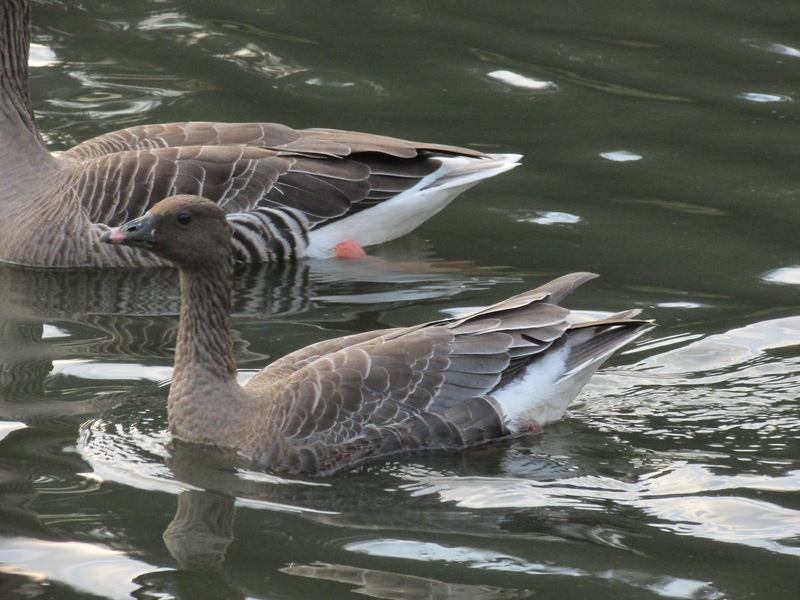 Although I wouldn't consider Pink-footed Goose (also known as Pinkfoot) to be an urban bird, it is a species that I regularly see. Skeins of this migratory geese, announced by a chorus of high pitched calls, regularly fly over the city in October and March, on their way to and from their breeding headquarters in Iceland and Greenland. 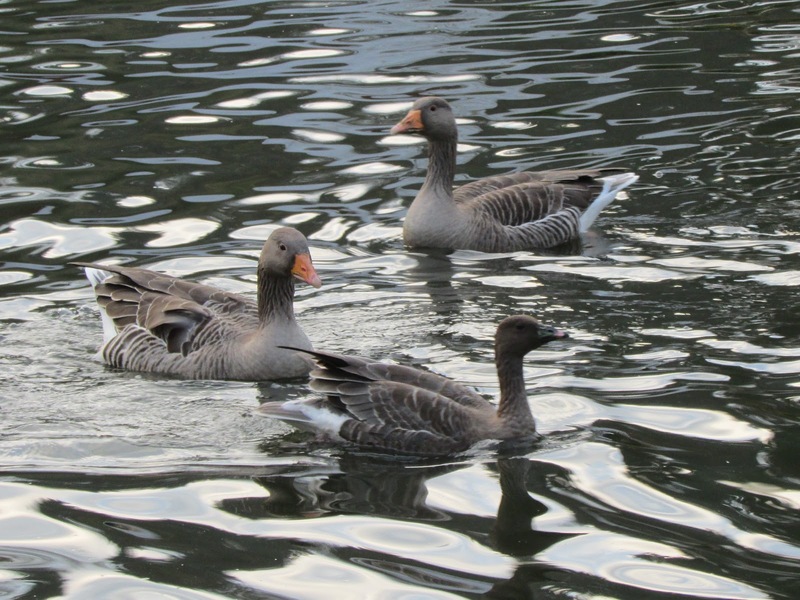 Occasionally, however, a straggler will turns up with Greylags in local parks, allowing a closer look. 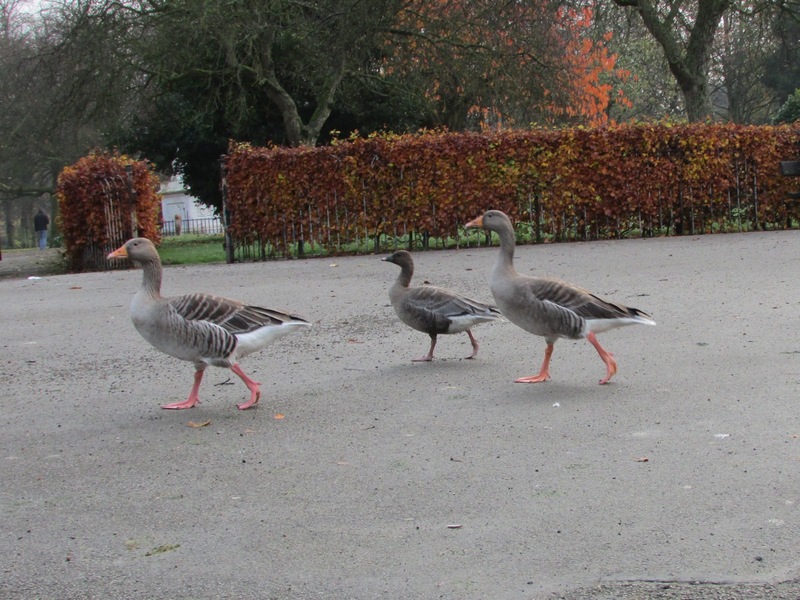 On my way to work, walking through the park, a flock of Canada Geese and another of Greylag geese were about. While counting them I noticed a much smaller goose, a Pinkfoot, amongst the greylags. They have small bills, marked with pink, much darker head, contrasting with the slaty back. I think this individual was a young bird born this past summer, as you can see two types of feathers in its flanks and back, as the larger adult feathers, with a pale edge, have started to grow. The furrows that adorn the neck of adult geese are not yet sharply defined. The goose wasn't welcome and was often lunged at by the Greylags. Surprisingly, it was quite relaxed in the park, despite proximity to people, and it got very close to me as it followed the other geese across the lake and then to the grass to feed. I other occasions when had previously seen other Pinkfoot with greylags, it was also young birds. I wonder if leaving with your own species as the flock departs takes some learning. Geese need to reach a consensus before leaving as a flock, a decision that takes place by increasingly noisy vocalisations and movements of the birds of the flock when they are ready to leave. If a young bird misses the cues, it will fail to take off might miss the flock altogether, becoming stranded possibly with another geese species. 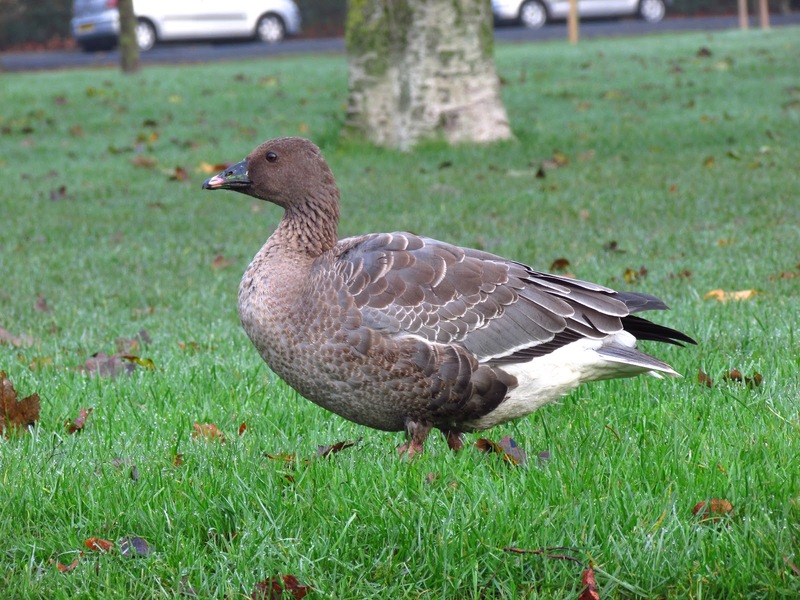 Geese have long lives and move about, so most likely, while following the greylag flock in its travels, it will eventually meet a Pinkfoot flock and the young bird will be reunited with other members of its species. Walking towards the grass. The difference in size between both species is evident here.